GALLIPOLIS — With the Halloween season finished, Gallipolis in Lights is finally ready to begin hanging lights and decorations in anticipation of winter’s holiday season this Saturday in Gallipolis City Park. According to Anita Moore, Gallipolis in Lights member, volunteers and group members alike have collectively created around 1,000 balls made of chicken wire and laced decorative lights through them. She cited the Nov. 2 fundraiser and volunteer workshop at Courtside Bar and Grill as being immensely helpful for the group’s ball count goal being reached. According to fellow member Matt Johnson, he and others will begin hanging lights around 8 a.m. Saturday morning. Volunteers are welcome to assist. Moore said that students, kindergarten through eighth grade, were asked to participate in an essay writing contest across Gallia County. Winners were asked why they thought they should be the ones to “throw the switch” for the lighting ceremony that officially begins the Gallipolis in Lights decoration season. The winners of the contest will be allowed to turn on the switch at the park lighting ceremony Nov. 25 and read their essay alongside state Rep. Ryan Smith, R-Bidwell. Moore also said that organizations across the county have been asked to participate in a themed Christmas tree decorating project. Trees are anticipated to be real and 6 to 10 feet tall. Ornaments could be made or purchased. Trees will need to be brought to the park and set up Nov. 21 between 9 and 11 a.m. Trees need to be lit with LED lights and decorations must be secured to tree branches. Moore advised tree decorators to remember that trees can potentially be out in the park for up to two months and will need to endure weather conditions. Decorations need to be waterproof and zip ties should be used to secure decorations to branches. 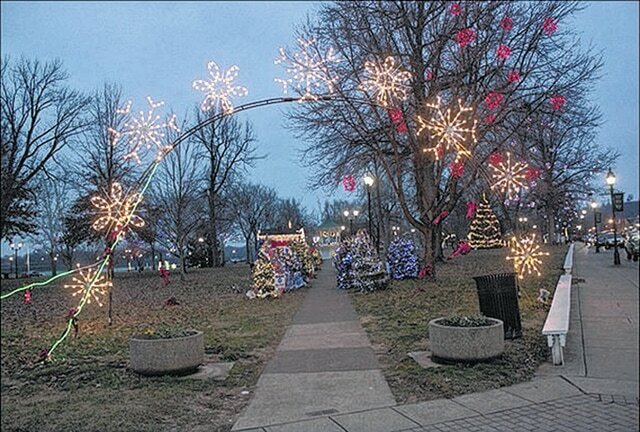 The official Gallipolis City Park lighting ceremony will be 7 p.m. Nov. 25. “You can’t even describe it,” Moore said about the lights in the park. “You have to drive through to understand. You feel like you’re in a movie, that it isn’t real the first time (one drives by). It’s so surreal. The lights are just beautiful and now we’re adding even more lights. I just can’t wait for everyone to see it. You just want everyone to experience it because it’s so pretty. People come from all over now. We’re getting people from out of state that come who have heard about (Gallipolis in Lights) and this is only our third year doing it. Members of Gallipolis in Lights will begin hanging Christmas lights around 8 a.m. Saturday morning in Gallipolis City Park. http://aimmedianetwork.com/wp-content/uploads/sites/42/2015/11/web1_GallipolisInLights.jpgMembers of Gallipolis in Lights will begin hanging Christmas lights around 8 a.m. Saturday morning in Gallipolis City Park.